This Irish sweatshirt features soft green fabric with a rich, color on color stitching that is beautifully sewn on a 55/45 cotton/polyester blend Anvil crew sweatshirt. This Irish sweatshirt is enhanced with over 50,0000 embroidered stitches that feature Ireland and shamrocks along with Celtic knots and the harp. 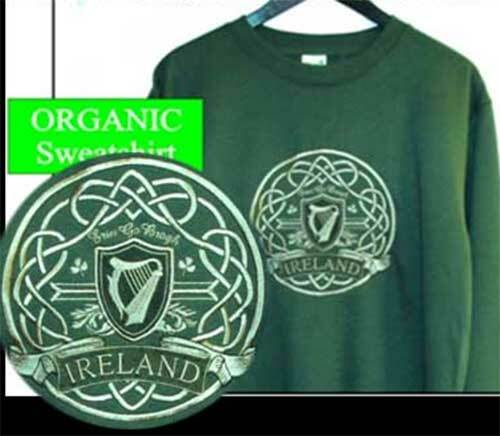 The Irish sweatshirt, in city green color, also features the words Erin Go Bragh that states Ireland forever in the Irish language. This pullover Irish sweatshirt is received with Celtic knot and shamrock history cards, compliments of The Irish Gift House. Please note that this Celtic sweatshirt is available in limited sizes.